Thank you for your interest in our Albany, GA law firm. If you are seeking an Albany Injury Lawyer, look no further than the law firm of Link & Smith P.C. The city of Albany, GA is a quaint community with the feel of a small town and the conveniences of a big city. Because Albany is located away from the major Georgia interstates, Albany residents are accustomed to a quieter lifestyle. Despite the fact that Albany is a quiet community, personal injuries are not uncommon. 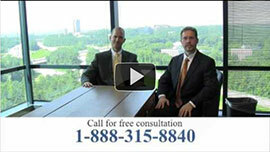 If you have suffered a personal injury, you need an Albany injury lawyer. Whether you have been injured on the job or in a car wreck, at Link & Smith P.C. we are here for you. Although we exclusively practice personal injury law, this gives us the focus needed to handle your claim in the most comprehensive manner possible. At Link & Smith P.C., our firm focuses on many different aspects of personal injury law, including motorcycle accidents, auto accidents, tractor-trailer accidents, texting-and-driving accidents, DUI victim representation, and even boating and jet-ski accidents that occur on Lake Blackshear. We work strictly on a contingency basis, which means we will not receive compensation until you get the case results you deserve. With over 40 years of combined experience, we are confident in our ability to represent you as an individual and fight for your rights as a victim. Our case results speak for themselves. We have won claims ranging from a few thousand dollars to upwards of $40 million. At Link & Smith P.C., our personal injury lawyers here to meet the needs of Albany, Ga residents. If you are not able to come to our office, we will be happy to meet you in the comfort of your own home. For a complementary consultation, call our Albany, Ga injury lawyers at 503-445-7031.